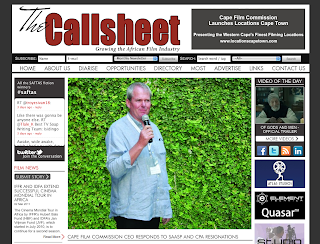 Just 10 weeks after Denis Lillie took over as The Cape Film Commissioner, well before he’s even hired any staff, he’s already facing a major challenge: The Commercials Producers Association (CPA) and The South African Stills Producers Association (SAASP) have both resigned their seats on The Cape Film Commission (CFC) board as a vote of no confidence. The Callsheet’s editor Kevin Kriedemann asked him some hard questions. This morning’s press release from The Commercials Producers Association (CPA) and The South African Stills Producers Association (SAASP) gave a number of reasons for their resignations from the Cape Film Commission (CFC) board and their vote of no confidence. Firstly, they said that the Commission “refused to take up matters which adversely affect the industry in favour of costly events and unnecessary international marketing trips,” which presumably referred to your recent trip to The Berlin Film Festival. Why did you go to Germany? It was a surprising remark because the board representatives from SAASP and CPA both proposed at the first board meeting I attended in December that I should represent the CFC at the trips abroad. It was seen as important for me to experience how the markets worked and network with film commissioners from around the world. It was already on the agenda when I was appointed; it was also in my contract of employment which was approved by the board. One of the big positives was meeting the South African embassy in Berlin, where we agreed to host an industry day and high level reception next year with the Berlin CoProduction Market to showcase German-SA co-productions. The trip to Berlin and my time in London proved to be an exceptional marketing opportunity. What I was hearing overwhelmingly is that the word is out that we’re open for business. As a consequence of meetings with other film commissions and The UK Film Council, we were referred to at least three feature films that we expect to film here and which have asked The CFC to act as an enabler. At Berlin it was also fantastic to sit in an audience of over 1 000 people and see Mama Afrika get a standing ovation. The press release referred to “a culture of denial” at The CFC. When you went to Berlin, were you unaware of the locations problems? I have been spending most of my time addressing the locations and permits issues directly with our members, including representatives of the CPA and SAASP. I only received a copy of the CPA Locations Recovery Plan in early January as for some reason the CPA and SAASP board members hadn’t passed me a copy it. Until then, I wasn’t aware of its existence. After reading it, I made a point that it seemed a valid document, so I’m very aware of the permitting locations issues that need to be smoothed out. I am not sure why they are referring to a culture of denial as there have not been any denials made in relation to the location and permits issue within the CFC or the CTFPO. In fact it is the opposite and I’ve had frequent meetings, email exchanges and phone calls with the Film Office and the City’s Department for Economic Development about industry concerns and how we can escalate the situation. Just before I left for Berlin, I had called for a meeting with MEC Alan Winde, Alderman Felicity Purchase and key representatives from The City and Province, who at that meeting committed to addressing and resolving the problems. The Cape Town Film Permit Office is funded directly by the City of Cape Town and it is their responsibility to make that work as well as possible. Our role is to act as an interface to highlight the issues which are compromising the industry, which we did and are having some success with. I am sure that industry appreciate that the locations issues is a problem experienced internationally. Although we still need to deal with our matters seriously, most busy cities around the world have road closures and permit and miscommunication problems.